It's no secret that Walt Disney was a huge animal lover, but apart from his True-Life Adventure series, his films typically dealt with more domestic animals like dogs. There were many challenges and dangers to working with wild animals, which the studio had a minor experience with from Swiss Family Robinson. A book by Ian Niall served as the inspiration for the film. Norman Tokar directs his third Disney film, most likely chosen for his experience with animals on Big Red and Savage Sam. Lowell S. Hawley adapted the screenplay, having already written Disney's Swiss Family Robinson, Babes in Toyland and In Search of the Castaways. Brian Keith from The Parent Trap plays Sheriff Pete Williams. His wife is played by Vera Miles, best known for starring in Psycho, in her first of many Disney films. British actress Pamela Franklin was cast in the lead role of Julie, her only theatrical Disney film although she had starred in a Wonderful World of Color movie a year prior called The Horse Without a Head. Sabu stars in his only Disney film, who died in 1963 shortly after production wrapped. Kevin Corcoran (Old Yeller, Swiss Family Robinson) has a supporting role in his final Disney film. Other familiar faces include Edward Andrews (The Absent-Minded Professor), Una Markel (The Parent Trap), Peter Brown (Summer Magic) Connie Gilchrist (The Misadventures of Merlin Jones) and Jack Albertson (Son of Flubber) who would return to the studio in 1981 as a voice in The Fox and the Hound. Most of the film was shot at the Disney Studio. 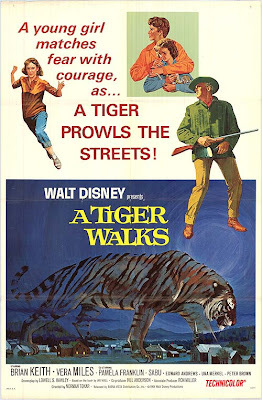 This was the first film to use a full grown tiger, instead of a young and easier to train one. During production, the tiger once broke through a sheet of glass that was separating it from the cameramen and crew. Nobody was injured in the event. The film opens with footage of a tiger roaming the wood as the credits roll. A circus truck gets a flat tire in a small town and has to wait a few hours for a new one. Meanwhile, the trainer is worried because the tiger hasn't eaten yet. The driver gets drunk while waiting and decides to open the truck for a kids to see.He proceeds to aggravate the tiger by poking it with a stick and it gets out. A girl named Julie gets a scraped arm when the crowd runs away from the tiger. Her father the sheriff gets involved and leads a group to try and capture the tiger in the fog. Meanwhile, the story catches national headlines bringing lots of media personnel to the small town when the tiger kills the truck driver. Julie ends up on the news and gets her father in trouble with the governor, who he dissuaded from calling the national guard. The governor decides to call them and they arrive on a full scale hunt for the animal with intentions to kill it rather than capture. The men start chanting "Get the tiger" and the kids turn it into "Save the tiger" and turn the media attention towards a campaign to raise enough money to buy the tigers and put them in a zoo. The campaign changes the minds of some of the men on the hunt and they decide to capture the tiger instead of kill him, leading to a celebration in the small town. A Tiger Walks was released on March 12th, 1964. Critics were rough on it, claiming it was only fit for kids interested in animals and would bore any adult. It wasn't a success at the box office and debuted on The Wonderful World of Color in 1966. It was first released on home video in 1986. The real core of the film is the relationship between Julie and her father. The government in this small town is corrupt and her father is trying to remain in their good graces to keep his job. In the end, he realizes that saving the tiger is the right thing to do. If you can connect with that, then you will probably enjoy this film. At times it can get a little dull, but it has its redeeming qualities. I wouldn't say its as bad as the critics in 1964 did. There is a Disney in-joke where Una Markel as the hotel owner is so happy to have all of her rooms booked that she starts to sing "Zip-A-Dee-Doo-Dah" from Song of the South. A Tiger Walks is currently available on DVD as a Disney Movie Club Exclusive. The film is presented in pan & scan fullscreen, although its original theatrical aspect ratio was widescreen 1.75:1. There are no bonus features.